Pickled Radish (huah chai bpoh in Thai) is made from salted and pickled daikon-like turnips or radishes. It has sweet and salty flavor that provides a nice contrast when added to foods. 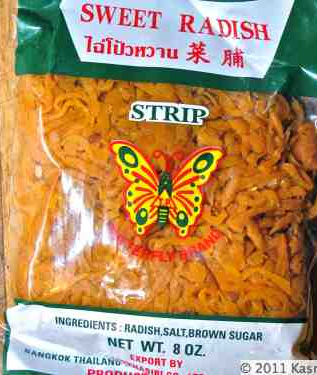 It is often used as an ingredient in Pad Thai.